The Selinsgrove racer has now captured all three PASS/IMCA features run so far, but this was hardly an easy win. With 21 of the 22 sprinters on hand making the call for the feature, traffic was an incessant issue on the wide Path Valley quarter mile. Port Royal’s Alleman grabbed the early lead from fellow front-row starter Dodson – the Middletown racer was celebrating his birthday – but just as the leaders were moving into heavy traffic, a lap seven caution bunched the field. On the restart, Duke, who had moved from sixth starting position into third, shot past both leaders. The frontrunners then had a close call on lap nine when Cale Reigle (Newport), Keith Prutzma (Hamburg) and Dave Wickham (Hanover) tangled in turns one and two. The longest green-flag run of the night followed, but Duke made it through traffic well enough to keep his challengers at bay. Terry Schaeffer got into the turn three wall with two laps remaining, but on the restart, Duke chose the middle lane and held off the outside-running Dodson for the win. Sweigart moved from eighth starting position to third, with Frye coming from tenth to fourth – the rookie racer’s first Top 5. Kyle Ganoe was the night’s biggest mover, advancing from 20th starting position to 11th. Newlin, John Walp and Sweigart were heat race winners for the 22-car field, with Sweigart taking his heat win via a last-lap pass over Duke in traffic. The second-place finish was also the season’s best for Dodson, a PASS “rookie” with extensive experience in other sprint car divisions and super sportsman. This year’s large PASS/IMCA rookie class includes several drivers who are rookies in name only: Prutzman has been racing for more than four decades. Next Saturday night (April 20), the PASS/IMCA sprinters return to BAPS Motor Speedway to complete a feature called due to rain on April 7 after one lap had been completed. A full show of heats and another 20-lap feature will be run as well. The super sportsman cars, street stocks and extreme stocks also are on the card, along with an Eastern Museum of Motor Racing display and track time for antique and classic race cars. 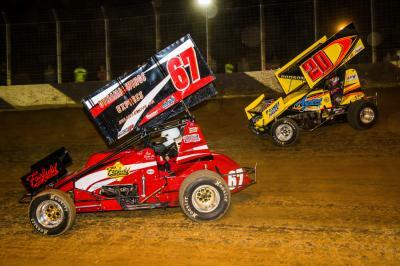 On Friday, April 26, PASS will join the Laurel Highlands IMCA/RaceSaver Sprint Car Series for a co-sanctioned event at Clinton County Motor Speedway, and it will return to Port Royal Speedway on April 27.